We had a whale of a time with our lovely client O2 Business last week, launching the country’s most high-tech ice cream van. It was part of our “digital makeovers” campaign for O2 Business, which aims to show (rather than simply tell) how technology can help even the smallest and most traditional business thrive and stand-out. And what a makeover. We worked with Guildford-based Tony Fresko to modernise their 40 year old ice cream van business, kitting them out with the latest smartphones, tablet PCs and Microsoft Office 365 software. 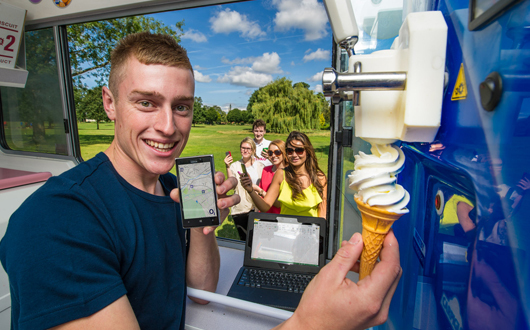 Through the help of O2 Labs, we also created the world’s first ice cream van tracker app, which allows hungry customers to instantly find their nearest van from the convenience of their phone – we do like to solve real consumer problems here at H&G! The result was a great, eye catching story for the run up to the August Bank Holiday that the media loved. Coverage is still coming in, but already it’s landed great pieces in the Daily Mail, Daily Star, Daily Telegraph, Metro, Gizmodo and MSN, as well as crackers in the trade and local media, including Fresh Business Thinking, ITPro and BBC Radio Surrey. The cherry on the media cake though was a live interview with Tony Fresko’s fleet manager on CNBC’s flagship slot, the European Closing Bell. Now that’s not something you see every day. We didn’t stop there and also took the van on a publishing house tour, giving out free ice creams to drive social engagement, not to mention miles of smiles. As always, great work from the team who remained, ahem, “chilled” throughout (sorry).